It’s February and as you’re staring at the mercury dipping into single digits, I know what you’re thinking! “It’s cold outside.” The thought of enjoying the warmth of your comfy bed is extremely tempting. Don’t let that stop you! If I have the choice between riding in a heat wave, at 40F when it’s raining (most miserable), or in subfreezing temperatures, I’d choose the latter in a heartbeat. It’s amazing how quickly your body can warm up. Often, I have to take off one layer as I have tendency to work harder (I’ll take that!). Being a year-round bike commuter, I’d rather hop on my bike than getting into a car that hasn’t been heated. Here are some benefits of winter riding just to list a few: 1) you work harder, 2) you burn what you gained over the holidays and the Banquet (ha), 3) you improve your mood, and 4) you get less sick! While on the topic of winter riding, the International Winter Bike to Work Day is this coming Friday, February 8th, 2019. For those who missed the SCU Annual Award Banquet, what a great evening it was! 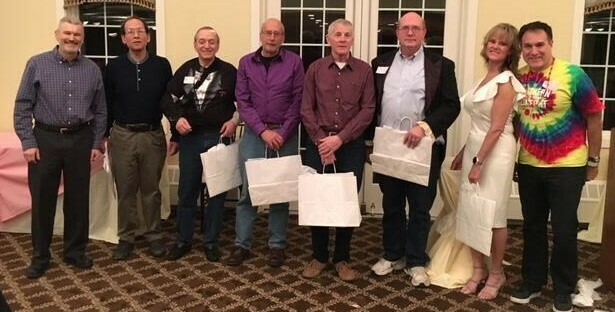 We celebrated our accomplishments of 2018, acknowledged and rewarded our volunteers, ride leaders, and the individual members for their dedication. All of this was enjoyed in a very festive environment. We caught up on things during the reception that was followed with a delicious dinner. 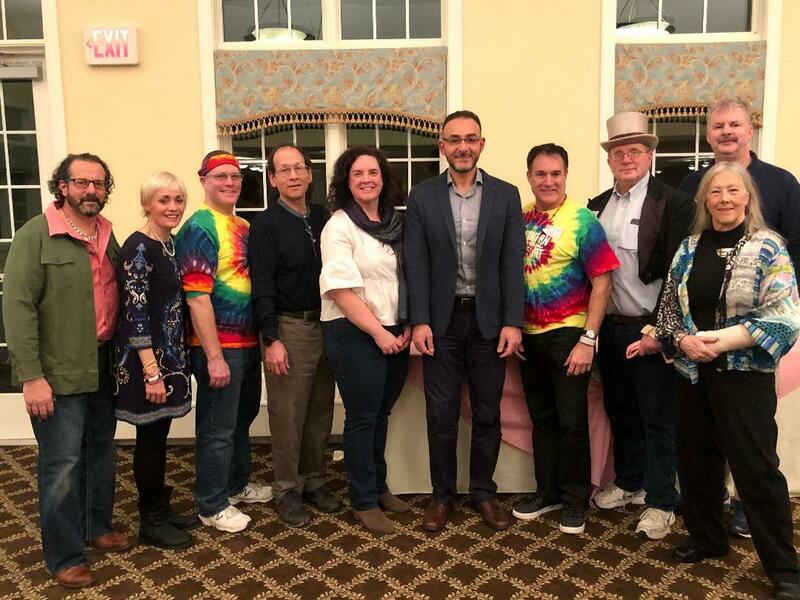 A big Thank You to Robin Einhorn, our outgoing Social Director, and her committee for all their hard work in making the Banquet a success. The addition of the comedians this year took the banquet and our laughs to the next level! Finally, I am excited to announce that the registration for the Quad in its 20th Anniversary edition has opened! Happy 20th Anniversary to our Signature ride (2000-2019)! The Quad will be held on Saturday May 18th. As its name suggests, the Quad will take you into a beautiful journey starting from Green Lane Park in Montgomery and winding through Berks, Lehigh, and Bucks counties before returning to the park for an excellent variety of food. So don’t let the winter blues settle in. Get out of bed and register early for the Quad (click here) while sipping your hot coffee before heading to your ride. Last but not least and as we all should do, a big shout out to all our volunteers for their time. I call for you to pledge to volunteer for one of our upcoming events this year, including of course the Signature Quad!! SCU held its annual Banquet on January 26th at the Flourtown Country club. The Groovy 60’s theme brought out an impressive array of tie dye and hippie gear! 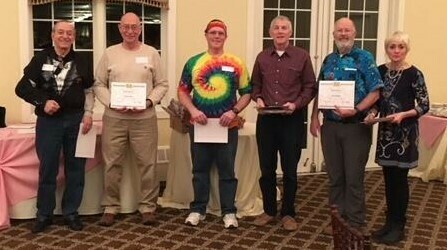 SCU members were thanked for their volunteerism and celebrated for their cycling achievements. Attendees were treated to a cocktail hour, buffet dinner and a surprise visit from two hilarious comedians, Anita Wise and Norm Klar. Banquet pictures can be found on the SCU site. Either click the "Awards Banquet 2019" button at the top or check them out in the SCU Photo Albums tab. See below for a full list of the winners. Special thanks to Robin Einhorn and the entire Banquet committee for the fun-filled evening! Steve Muth will be assuming the role of 2019 Quad Director. See below for messages from Joe Feeney and Steve Muth. Thank you, Joe, for leading the charge on the Quad event over the past few years! I have been given the opportunity to participate in Bike the US for MS East coast tour this spring. Due to this commitment to ride from St Augustine Florida to Bar Harbor Maine I’ll be on the road from late April, through Memorial Day weekend, so I asked Steve Muth to take over as Quad Director for this year. Steve has graciously agreed to take on the responsibility of organizing the Quad this year, while I will assist him and the committee. I am certain Steve will continue to expand the Quad, and make the event a must do ride and great experience for all. Thank you for all the support for the Quad! I felt honored when Joe Feeney asked me to consider assuming the role of Quad Director, and further honored when the EC voted to appoint me to the position. I know it was a difficult decision for Joe to step down. 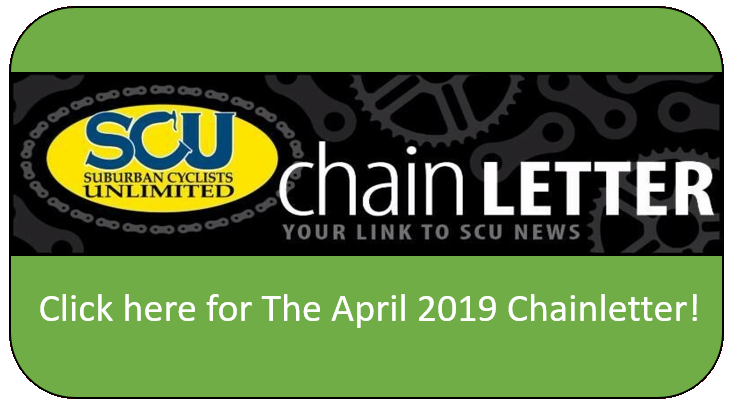 He has shown a strong commitment to SCU’s signature event over the past few years and has already made excellent progress on planning this year’s event. I will build on his work thus far and continue the club’s tradition of making the Quad a premier cycling event in the region. In the coming months the Quad Committee will be meeting regularly to plan and organize in advance of the big day. All members are welcome to attend and share their ideas. Look for the dates on the Meetup calendar. Hope you can join us! It’s no coincidence that we are shining our spotlight on Doug and Linda Mueller this month. 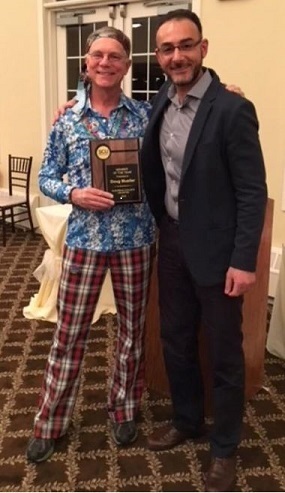 Doug was the recent recipient of the 2018 Member of the Year Award. Doug was instrumental in helping to revamp the SCU bylaws this year and the implementation of the long-awaited electronic balloting process. However, that just scratches the surface of all the ways SCU has benefited from Doug and Linda’s volunteerism and teamwork. Doug has been involved in several special project roles as well as an SCU Executive Committee member for 13 years in varying capacities, including President for 2 years. Linda was the designated Baking Queen for 15 years for both the Quad and the Nock. She improved the baking goods collection process over the years, eventually recruiting coordinators to help at each of the large ride sites. She now assists with the pre-Quad day party and collection/distribution of donations to the rest stop sites. 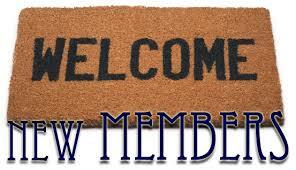 She was also a member of the Executive Committee for 6-7 years as Secretary and New Membership Director. Needless to say, they have been an integral part of SCU’s success over the years. The Mueller’s have been members of SCU since 1999. That April, they decided to try SCU’s Mexican Metric…on their hybrid bikes. They were approached by Pat Rock and Joanne Anderson, who convinced them to join SCU. They were hooked! By that Fall, they upgraded to Cannondale road bikes and completed the MS150 (100 down and 75 back). 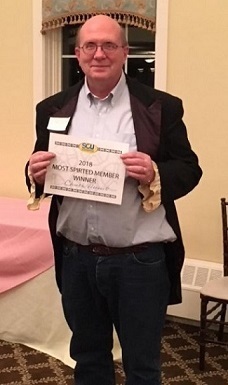 Within 3 years of joining SCU, Doug was leading rides with Linda out of Hatboro Horsham. Doug and Linda now lead rides out of Hatboro Horsham for the 13-14 mph weekday group as back-up for when the turn-out is so large (as it often is), it needs to be split into smaller groups for safety. More famously they are known for their “Movin’ with the Mueller’s” rides. These rides were started 5-6 years ago to help provide additional variety for weekend rides. They typically will take routes that they could not take on a shorter weekday ride. This may involve a scenic trip to New Jersey or up to Bucks County. They have built a large following over the years as they have become known for providing well-planned, interesting, safe and enjoyable routes. Doug always leads, and Linda always sweeps. Linda rides a little slower (and Doug can’t drop Linda! ), so riders are assured that the pace will be held as advertised and they won’t get dropped. Watch out for their rides in Meetup….and watch out for Flying Monkeys. 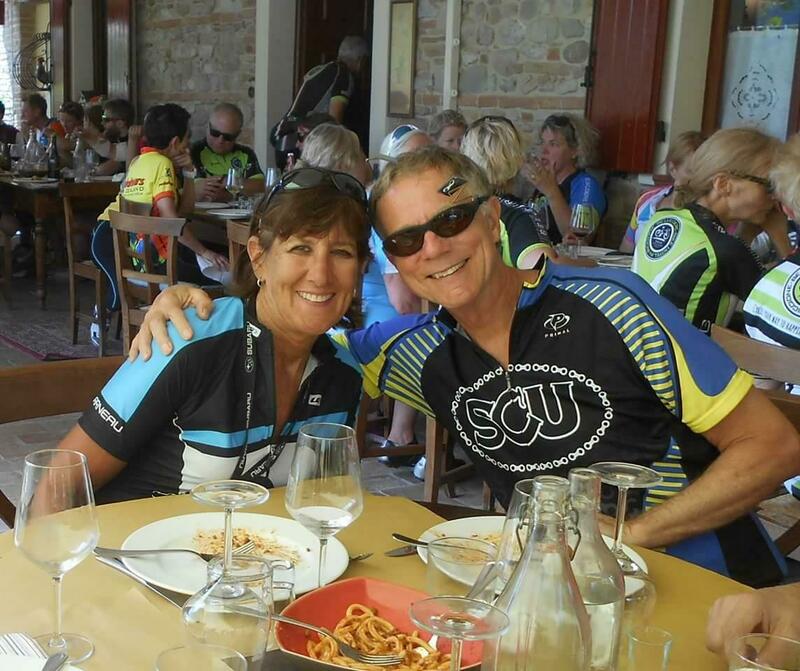 When they’re not helping out SCU, Linda and Doug (both retired) enjoy spending time bike touring. One of their first adventures was the MOOSA tour through Maine, New Hampshire, and Quebec. They have also toured various locations including the Finger Lakes of NY (Bon Ton Roulet), the coast of Croatia, Berlin to Krakow, and the Italian coast. Their favorite bike tours were island hopping in Croatia and traveling along the Adriatic coast in Italy. Their next adventure will take them to Germany in August. They are currently looking forward to warmer weather, so everyone can come out and start Movin’ with the Mueller’s! SCU and BCP have jointly created a Ride with GPS club account for its members. To use the account, club members need to have a personal Ride with GPS account. If you go to the club site and do not have a personal account, you will be allowed to sign up for a free basic Ride with GPS account. The club site will allow you to access the club ride library; get turn-by-turn navigation on a club route; use voice navigation; download PDF maps and cue sheets; and use maps on the Ride with GPS mobile app while offline. You can also download route files for use on Garmin and other brand GPS devices. The club account does not let you plan routes, but personal accounts do. Curtis Schwartz (abdaddy@comcast.net), SCU Ride Director, is SCU's coordinator for the site. Chuck Herbert(cherbert@ccp.edu), SCU IT Director, can also help with technical assistance. • More details are available at cheltenhamadultschool.org, or, 215-887-1720. Course description is also listed on Page 17 of the hard-copy Cheltenham Catalog from Cheltenham Township..
• For more details, please contact Main Line School Night, or Riverbend. 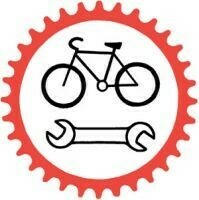 Both of these courses provide helpful information on essential topics, such as cycling safety & traffic laws, basic bike maintenance& simple mechanical repairs, how to perform a pre-ride check to make sure that your bike and gear are ready, etc. The inaugural Mid-Atlantic Greenways & Trails Summit will bring together leaders and advocates of active transportation and greenway and trail development to advance bicycling and walking innovations across the region. 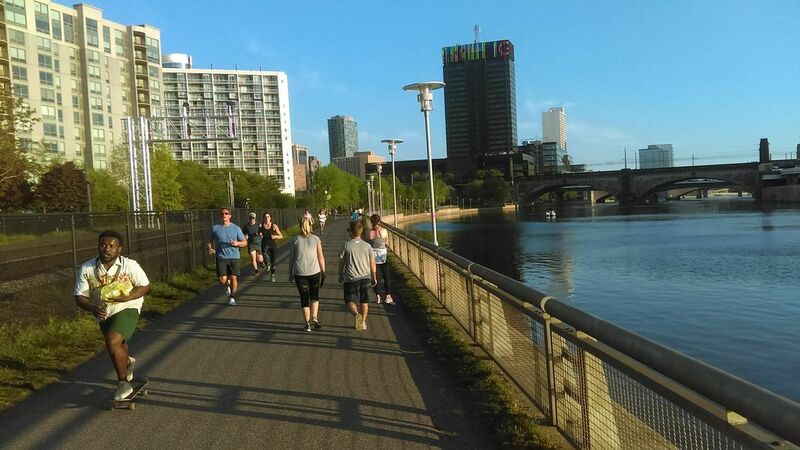 Celebrate the region's progress in developing the East Coast Greenway and other greenway and trail networks while looking at strategies for further advances throughout Maryland, Delaware, Pennsylvania, New Jersey, New York, and Washington D.C. Early bird registration until 2/15! Regular registration closes March 22.